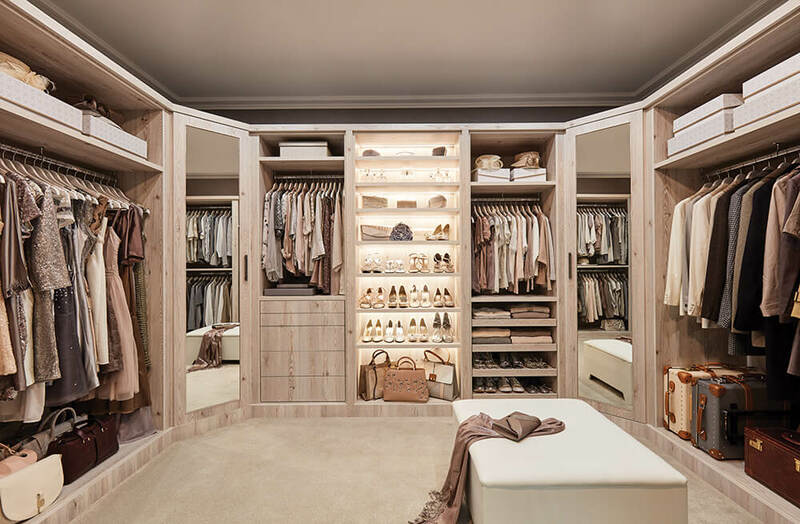 A walk-in wardrobe is a remarkably beautiful storage solution, whether its a dedicated dressing area in the master bedroom, a smart solution in an unused closet or an impressive design in a spare bedroom. Our experienced designers can spot potential in almost any room to help you maximise your space and make practical use of every square inch. Because our walk-in wardrobes are made-to-measure with millimetre precision, you’ll be amazed at how much you’ll be able to fit into a space. Our designers can work around awkward corners, sloping ceilings, tricky window sizes and high ceilings. All it takes is a little imagination, experience and skill. When it comes to a beautiful yet practical walk-in wardrobe, you have to consider your individual needs. 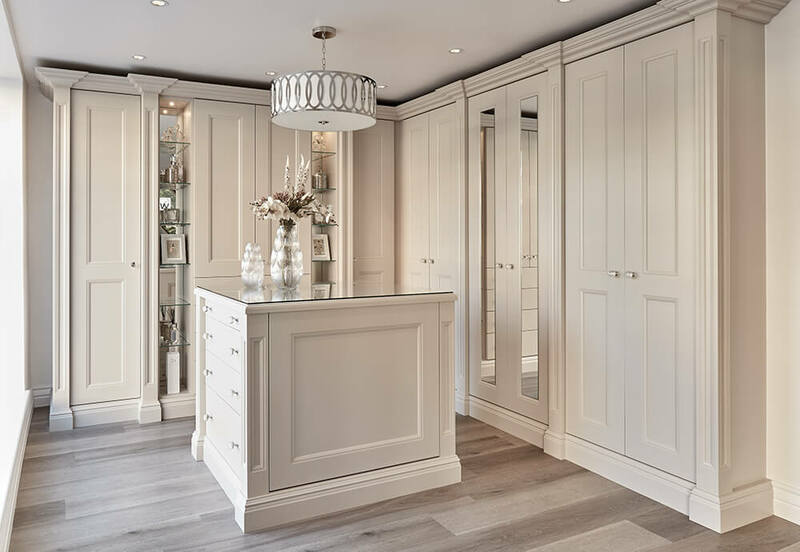 Our designers will work with you to plan the perfect solution to suit your everyday routine and lifestyle; you’ll be asked how you envisage using your new walk-in wardrobe. For example, if you have an extensive shoe collection, then a pull-out storage system or softly lit shoe rack may be a priority for you. If you share with your partner, maybe you want to have separate spaces with storage that’s optimised to specific clothing. Perhaps there’s a definite distinction between your workwear and your casual clothing collection and you want to keep your items separate. Our designers will look at your clothes and make allowances for the length of your evening gowns and even the height of your boots. Everything we build is beautifully bespoke so the end result will be as perfectly tailored as the fashion inside it. Open shelving is an excellent option for items you wear or use every day. Shoes and beauty products can be kept neat and organised allowing you to always see what you have while keeping the rest of your bedroom clutter-free. Pull-out rails maximise storage for hanging clothes, and they’re a great option for rooms with high ceilings because every inch of height can be used. To see what could be achieved in your home, take a look at these three stunning solutions. 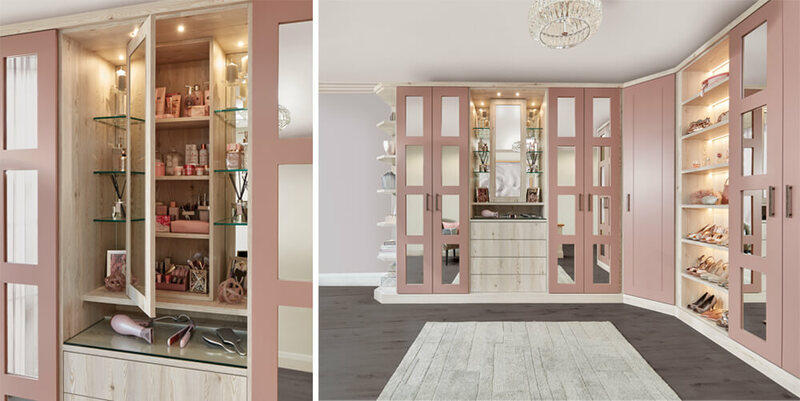 This beautiful walk-in wardrobe in Pink Dusk gives our client all the space she needs. A fresh alternative to the usual off white or wood, the pink paint finish provides this space with a feminine look and feel with a touch of old-school Hollywood glamour. We incorporated a fabulous concealed vanity unit complete with an illuminated makeup mirror that also doubles as discreet storage for beauty products. 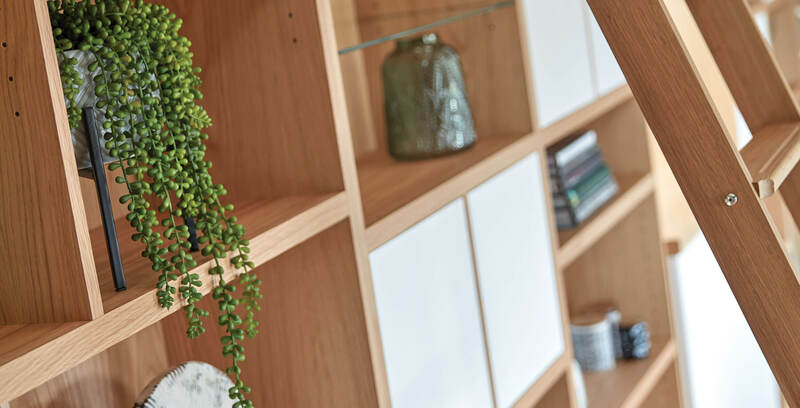 Rails were made-to-measure for the length of specific clothes, and the gorgeous glass shelving has integrated lighting providing a warm glow at night. This luxurious furniture finished in white larch, transcends the boundaries of conventional bedroom storage. It’s not just the clothes that have a home in this boutique-inspired design; each pair of shoes, piece of jewellery, scarf, tie and cufflink is conveniently stored away in its very own made-to-measure compartment. If you have a shared wardrobe space then lightweight, portable storage boxes are great for ordering small items such as winter accessories, socks, swimwear and t-shirts. This will create an organised personal system for both yourself and others. The epitome of grandeur and indulgence, this white dressing room was designed with the client in mind. 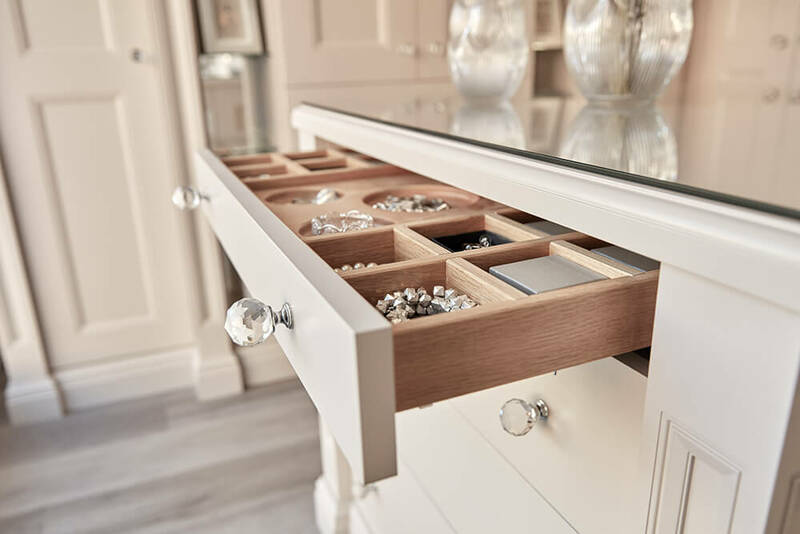 With an ever-changing collection of accessories, we designed bespoke drawer compartments so that each new piece could be perfectly housed in its own space. Every proportion and detail has been considered, from carefully selected cut glass handles that shimmer in the light to soft close drawers and a sumptuous central island. To find out how you could transform an unused space or a spare room into your dream walk-in wardrobe request your free brochure or design visit today.